Keep up with the snow as fast as it falls! Ice-Away Snow and Ice Melt Mat - 36" x 32"
The Ice-Away Snow and Ice Melt Mat is out of stock for the season and will not be available again until fall/winter of 2011. We apologize for any inconvenience. Keep your property safe, and keep up with the snow as fast as it falls, all winter long! The convenient, efficient and reliable solution to prevent snow and ice accumulation (and the resulting liability). No more shoveling, snow blowing, harsh chemicals, or embedded melting systems. Inexpensive: Less expensive than embedded systems, and goes where embedded elements cannot. Costs pennies a day to operate. Heavy Duty Construction: Made of an electrically operated heating element sandwiched between two protective surfaces of non-slip rubber, making it as durable as automobile tires and able to endure harsh wear. Flexible & Efficient: Plugs into any standard 110V outlet, melting up to two inches of accumulated snow in less then one hour. It comes with a 15 foot power cord that plugs into standard outlets using its own Equipment Leakage Circuit Interrupter (ELCI). Reliable: Designed to be left outside for the entire winter season. 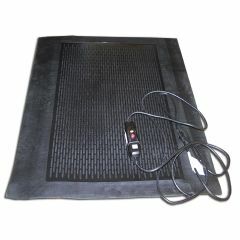 Each heated mat is built and tested according to the IEEE 515.1 electrical standard. I put it under the eave where the snow and water drip off of the house to melt the ice on the sidewalk. The product is in KS, on a ranch, keeping the path between the garage and the house clear...there's usually icy buildup from the roof dripping. The cats love it too! Do you have these for sale? I can find no price or ordering option on your site.